I threw a Halloween party for the boys this past weekend and I wanted a cute and unique treat bag to go along with it. I found an idea on the Martha Stewart site, but their instructions were severely lacking, so I decided to do a tutorial of my own. These treat bags are a two for one at any party, not only are they perfect for loading up with goodies for your guests to take home, but they are also great party decorations for a side table! Step 1: Unfold one brown paper lunch bag and lay it flat. Cut slits all the way down to the base, but be careful not to cut the base too. Step 2: Spread the paper bag you just cut out and arrange the slits of paper around it. Sort of like a sun shape. You can see the picture below as a guide. Step 3: Cut small slits in the top of another paper bag. These should only be about an inch long. Step 4: Place the whole paper bag with the small slits at the top standing up inside the paper bag that you shredded and have laid out on the table and fill with goodies. Step 5: Gather all the piece up together at the top of the standing paper bag, place a stick in the top of the bag and secure an inch or so from the top with tape. Once secure, tape a strip of black construction paper around it for a finished look. 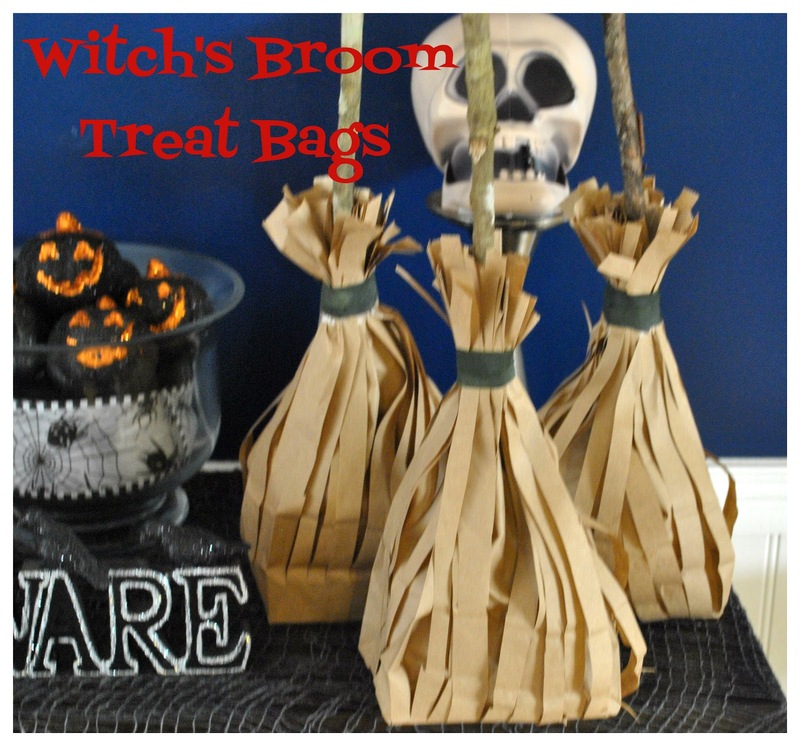 Have any DIY Halloween party ideas you would like to share? Love it! So simple and cute. What a cute idea! I'm looking for something different for the treat bags for my son's class. These are so much fun, I was hoping you would post how you made them, thanks! Those would be great for a Harry Potter party, too!